Once you get into town, you'll get a Holo Cast simply informing you it was made by Lysandre Labs. Talk to the guy right by the Pokemon Center to get an Ultra Ball. Cassius in the building north of the Pokemon Center teaches you about Pokemon boxes. The girl in the middle will give you TM46 Thief. Inside Camphrier Hotel west of the Pokemon Center, you'll find a girl who'll give you a Full Heal. If you go upstairs, you'll find Mr. Bonding. Talk to him to get another O-Power: Sp. Atk Power Lv. 1. Right outside is a person who'll give you a Berry Juice. Hop the ledge to pick up an X Attack. In the house just north of that, you'll find a man asking you to show him a Pokemon of a random type each day. The red-haired woman will give you a Sweet Heart. Go to the south of the city to pick up a Star Piece, which is nothing more than something that can be sold for some good money. North of Camphrier City is Shabboneau Castle. Go check it out. You'll find Shauna in there asking the guy inside about Mega Evolutions. He seems alarmed. Another guy walks in, tells the first guy to go to Route 7. Follow them to Route 7. Before you leave, though, go upstairs to pick up an Escape Rope. This will help you instantly get out of places like caves. Head west to Route 7. Head west on Route 7 and you'll bump into the same people surrounding a sleeping ">. To wake it up, you'll need to grab the PokeFlute, which can be found at the Parfum Palace on Route 6. Head over to Route 6 now. 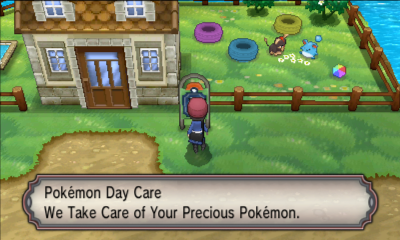 If you choose to explore the south side of Route 7, you'll find a grandpa and her granddaughter in a berry field. 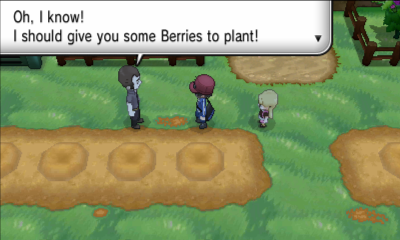 If you agree to help them with the field, the grandpa will teach you how to plant berries. He gives you Oran Berries, Pecha Berries, and a Sprinklotad to water berry trees. To plant a berry, place it in the soil and water it afterwards. Then, remember to come by often to water it, weed it, and clear it of Bug Pokemon. You can pick up a Miracle Seed at the southwest corner of the field. This item boosts the power of Grass-type Pokemon that hold it. 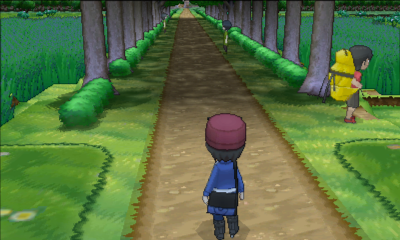 The path to Parfum Palace through Route 6 is just a straight path down. You'll battle some trainers along the way. There will be more to do on Route 6 later. Once you enter into the Parfum Palace area, talk to the first woman you see to get an Oran Berry. Go straight north from there to pick up the Ether by the fence. There's a Photo Spot at the southeastern corner of the courtyard. You can ask a photographer to come by to take a photo of you in front of the Palace. When you approach the gate to enter the Palace, a man outside will stop you and ask for a $1,000 entrance fee. Shauna comes by and complains about the fee. Both of you end up paying anyway. The gates open up, so go inside! Inside, you'll find Shauna and a man frantically looking for his Furfrou. 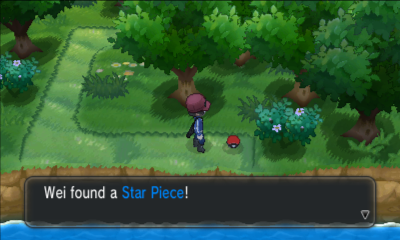 Before we help him find his Furfrou, let's go explore this place. 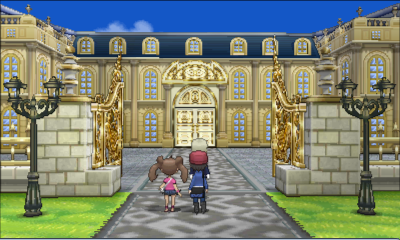 Parfum Palace is gigantic. Go east in the palace and up the stairs. Cross the hallway going west and you'll get to go out onto the balcony for a breathtaking view. Continue down the hallway to get to the other side of the second floor. On the other side, go into the second door from the right to pick up an Amulet Coin. If a Pokemon in battle is holding Amulet Coin, you get double the prize money after winning a battle. Go down the stairs on the west side, walk east, and you'll be back to where you started. In one of the rooms along the way is the king's bed. If you sleep on it your Pokemon will get healed. Now go straight out to the garden on the north side. As you walk past the bridge in the garden, Shauna will pass by you and tell you she's going to look in the back. The garden is composes of four maze-like areas. When you cross into these areas, you'll see things from a top-down perspective, making it easy to see where you're going and locate items to pick up. There are a few hidden items here too. 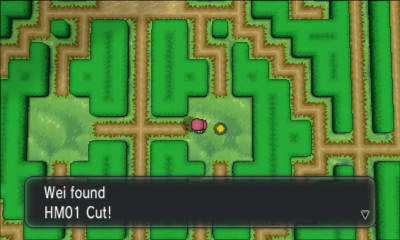 In the bottom-left maze, you'll be able to pick up HM01 Cut. This is needed to cut through certain types of trees in the game. There's also a Super Potion. In the bottom-right maze, you'll find an Antidote. In the top-right maze, you'll find a Pretty Wing hidden in one of the trees near an entrance. In the northwest corner of the garden, you'll find a Guard Spec.. 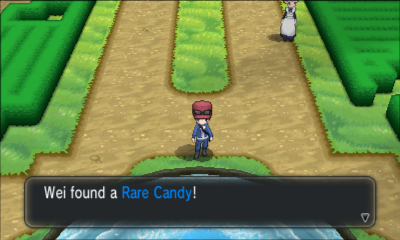 There's also a hidden Rare Candy at the top of the water fountain as shown in the screenshot. 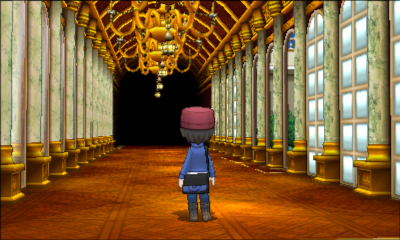 After all that exploring, go to the top-left maze and you'll find Furfrou standing right near the entrance. It will run away and Shauna will come by to help you out. 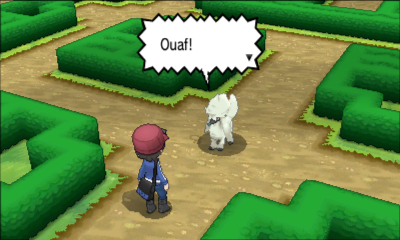 The two of you need to trap Furfrou in a dead end at the top section of the maze. To do that, lead Shauna to different parts of the maze. 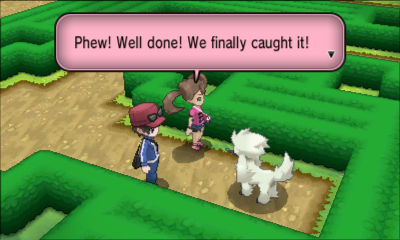 Turn around to ask her to stay there to block Furfrou from running in that direction. First get Furfroutrapped to the top portion of the maze by having Shauna stand at the entrance and then trap it in the dead end by having Shauna stand on the side. The man who lost his Furfrou comes by really happily to retrieve his Pokemon and asks you to meet him on the second-floor balcony. On the balcony, you'll find Shauna and spend some quality time with her watching fireworks. 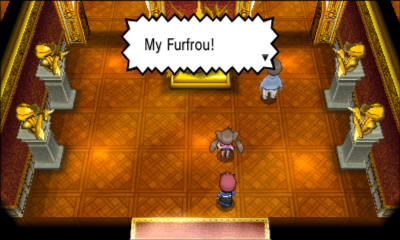 Afterwards, the Furfrou's owner comes by and asks his butler to give you the Poke Flute. He also gives you TM17 Protect. Now you can head back to wake up the Snorlax. Before you head back, though, explore the rest of Route 6. After exiting the Palace, head onto the southwest trail back onto Route 6. There are a bunch of trainers and some very tall grass here with a lot of wild Pokemon. Along the route you can find an Awakening, Super Repel (you'll find it useful if you want to avoid the barrage of wild Pokemon in the tall grass), Aguav Berry, and Ultra Ball. 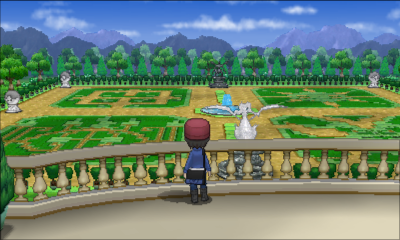 After exploring the western half of Route 6, go back to the Palace courtyard and go down the eastern half of Route 6. 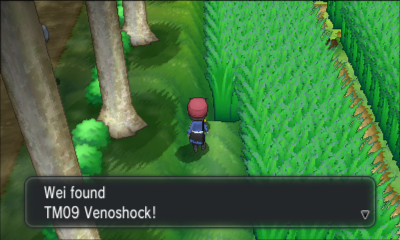 Here, you'll find an Antidote, X Speed, Paralyze Heal, and TM09 Venoshock. 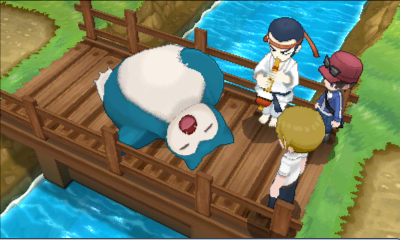 Head back to Route 7 to wake the Snorlax with your newly acquired Poke Flute. After you hand the Poke Flute to the guy, he'll ask if you're ready to wake it up. If you want to catch Snorlax, you should save the game first. 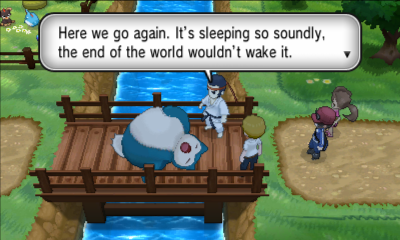 After the guy plays the Poke Flute, Snorlax will wake up and fight you. You can either catch it or make it faint. In both cases, the path will clear and you can go on exploring the route. 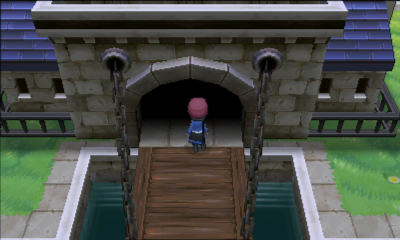 Past the bridge is the Pokemon Day Care, where you can leave up to two of your Pokemon here to breed. Trevor and Tierno will come by to drag you into the place to check it out. 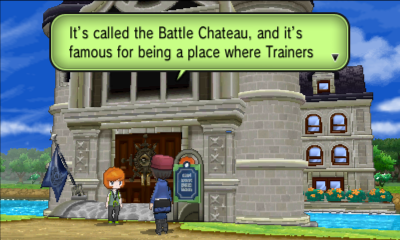 Also on Route 7 is Battle Chateau, a social club of noble Pokemon trainers. Once you enter, you're granted a title of Baron, the beginning title. As you battle trainers here, you'll level up. Go into the different rooms and areas of the Battle Chateau and you'll find quite a few Barons and Baronesses to battle. Once you get to the end of Route 7, you'll bump into Serena, Trevor, and Tierno, and Serena to do two-on-two battles. Afterwards, continue on the route to enter the cave. 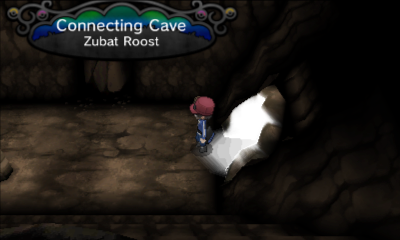 Enter the Connecting Cave and you'll battle a Pokemon Breeder. For now, that's about all you can do, since the rest of the cave is blocked out. Exit the cave and go south towards the other cave entrance. Go south from there past a patch of grass to pick up a Persim Berry and a Tiny Mushroom. Now go back to where you were and get into the cave. Talk to the woman along the way to heal your Pokemon. After that, you'll be on Route 8. 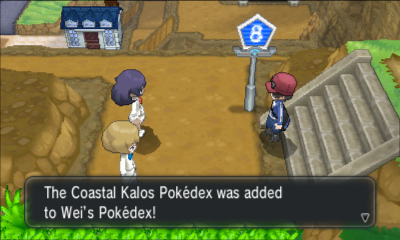 As you enter Route 8, Professor Sycamore's assistants will come by to give you the Coastal Kalos Pokedex. As you go south on Route 8, stay on the left side to pick up an HP Up. There are a few trainers to fight as you make your way down. Along the way, there are these steps you have to hop onto (if you get off your Roller Blades). 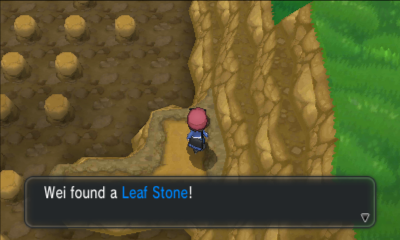 Hop across to pick up a Leaf Stone.. In order to proceed on the route, you have to hop onto steps from an earlier entry-point. Then, you'll be at Ambrette Town!